The last few days has seen rains in Tamil Nadu provide some respite from the heat and dry weather that was prevailing in the state since February 2017. While the interior places particularly along the Western Ghats has enjoyed some good spells of rains the coastal areas to the north of Pondicherry was left with mostly cloudy weather and in case of places like Chennai some drops of passing showers over the last couple of days. Yesterday was no different in terms of rainfall pattern with the interior districts of Karur, Erode Namakkal & Tiruppur scoring heavily with places along the Western Ghats in South Tamil Nadu also getting some good spell of rains. These rains would indeed be welcome relief for Karur and Namakkal district which possibly did not get even a single meaningful spell since the end of Southwest Monsoon last year. After almost a week of rains the current spell of rainfall activity is expected to come to an end in the next day or two. What was initially trough induced the rains in Tamil Nadu started with the coastal areas from Delta to South TN and then slowly became an interplay of wind induced instabilities with convergence zones developing on a daily basis through the wind patterns. Once the wind induced instability came into picture the rains shifted to the interior places of the state and have continued to remain so over the last 3 / 4 days. Similar trend is seen today as well with the Eastern Ghats playing a pivotal role in the likely areas that could see thunderstorms. Aided by the Orographic lift provided by these ghats and sustained by the wind confluence zone we are likely to see the thunderstorms develop over the districts of Namakkal, Salem, Thiruvannamalai & Vellore in the areas surrounding the Eastern Ghats like Kolli Hills, Jawwadhu Hills & Yelagiri hills. 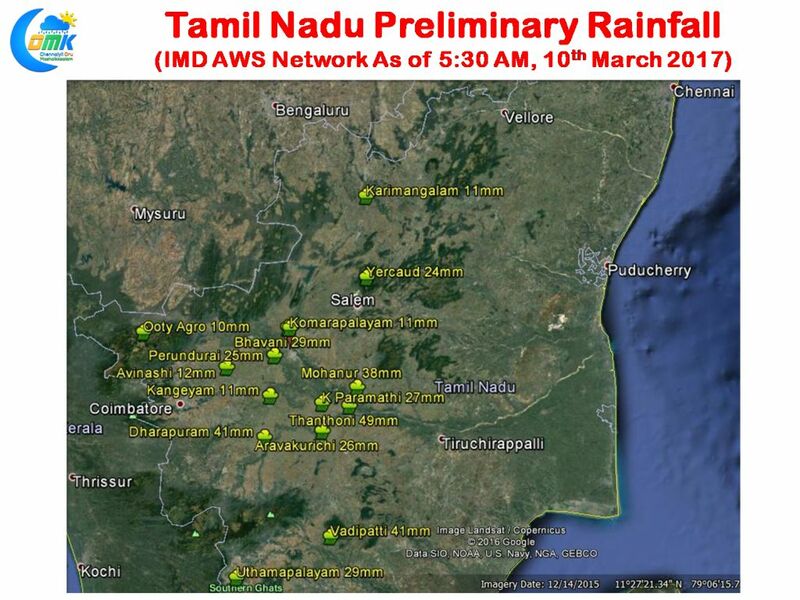 While Chennai and surrounding coastal areas could see some passing showers during the day at times there is a genuine chance of some early morning rains tomorrow (Saturday) which could be the parting gift from this spell of rainfall activity this March post which the rainfall is expected to slow down gradually through the weekend.